Determined to forge her own destiny, Alice Barrow joins the legions of spirited young women better known as the Mill Girls. From dawn until dusk, these ladies work the looms, but the thrill of independence, change in their pockets, and friendships formed along the way mostly make the backbreaking labor worthwhile. In fact, Hiram Fiske, the steely-eyed titan of industry, has banked on that. But the working conditions are becoming increasingly dangerous and after one too many accidents, Alice finds herself unexpectedly acting as an emissary to address the factory workers’ mounting list of grievances. After traveling to the Fiske family’s Beacon Hill mansion, Alice enters a world she’s never even dared to dream about: exquisite silk gowns, sumptuous dinners, grand sitting parlors, and uniformed maids operating with an invisible efficiency. Of course, there’s also a chilliness in the air as Alice presents her case. But with her wide, intelligent eyes and rosy-hued cheeks, Alice manages to capture the attention of Hiram’s eldest son, the handsome and reserved Samuel Fiske. Their chemistry is undeniable, soon progressing from mutual respect and shy flirtation into an unforgettable romance. But when Alice’s best friend, Lovey, is found strangled in a field, Alice and Samuel are torn between loyalty to “their kind” and a chance for true love. Young Alice is determined to start a new life for herself by becoming a mill girl in a cotton factory, working with other independent young women on the dangerous looms. One accident after another sheds light on the dangers of factory work, and the list of grievances causes a stir among the workers. But when Alice’s dear friend Lovey is found strangled in a field, tensions rise and a trial threatens the balance of all of Lowell — and tests the bond between Alice and her employer’s forward-thinking son, Samuel. Once again, Alcott delivers a great new historical perspective on industry, law, and inter-class romance. With The Dressmaker, we saw a determined young maid desiring to become a seamstress and designer, all during the turmoil surrounding the court cases following the sinking of the Titanic. This novel, too, is based on fact: the murder of a factory girl and the rise of unions and strikes in industrial America. 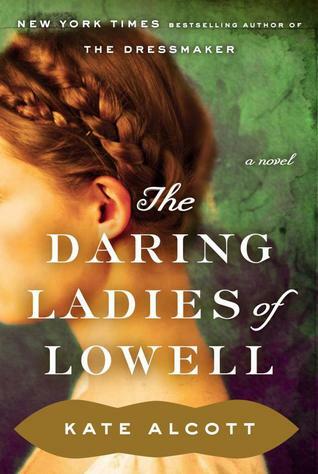 It was exciting to see how all aspects of the story — the wealth and opulence of the Fiske family, the spirited women in the factory boarding houses, the culture of a small town versus that of Boston, the law versus traditional prejudice — intertwined with one another, creating such rich detail and a vibrant story. Alice’s naïveté lends to her strong will and determination. From President Jackson’s visit onward, Alice was the voice of the workers without coming across as too strong or too weak. She spoke her mind respectfully, and never backed down. She’s quite an admirable character, and it’s easy to see how the mill girls loved her and how Samuel admired her despite her background. Social custom was a heavy topic, too. The Fiske family are of new money, and Grandmother is determined to make sure her son and grandchildren remember their origins, to look to reform and understand their employees’ grievances. Whenever I think of cotton mills and all the strikes, deaths, and horrors that came with the Industrial Revolution, I can’t help but be both frightened and disgusted with that bit of history. It makes reading fiction based on that difficult. And yet Alcott made each character’s hopes, voice, and personality shine so brilliantly that, for a moment and like Alice, I too forgot about the dreary hardships and absorbed the friendships, the passion for change, and the desire to break social code. Alcott is an excellent storyteller, and her next novel is definitely one to read. Thank you, Edelweiss and Doubleday, for providing this book for review! What a great title! And the story sounds even better. I love reading about that time period in history; it’s one of my favs. Can’t wait until this book shows up at my library. I want to be the first in line to read it. Great review. Thanks! Better make that request now! It’s out next Tuesday!